Elizabeth who puts the Ellie in Sass is a New York Native and moved to Los Angeles to continue her acting career 15 years ago. While she never imagined herself as being a salon owner she was always inspired by female entrepreneurs around her. Elizabeth took a leap of faith knowing she would regret it and is so thankful she listened to her gut. The salon has given her an incredible gift, pushing her to constantly grow and learn on a daily basis and can't imagine her life to look any different. Outside of the salon you can find her on General Hospital playing District Attorney, Margaux Dawson. Taking dance class, working out, and walking her pups is what you’ll most likely find her doing in between, while still finding time to enjoy everything Venice Beach has to offer with her better half and close friends. Oh and she also loves to karaoke preferably with Sass who is the Salt to her Peppa. Sarah aka Sass was born in Zurich Switzerland and moved to the states when she was 5 years old and now resides in Venice Beach. At a very early age, she was inspired by beauty, self care and helping women always feel their best. After many years of time and dedication to her craft she is one of the most sought after lash artists on the West side. Sarah continues to take great pride in her work and finds that the best part of her job are the relationships with the incredible women she has grown to know over the years. Being a part of a salon environment was something she had always dreamed of, the sense of community and support always spoke to her. While her lash game is strong, her love for her family is stronger. Her husband Jess, a constant rock (big shout to to him for helping the shop look as beautiful as it does thanks to his artistry and talent) and their two and a half year old daughter Presley is the brightest light in her life, and of course their first “born", Bronco the dog. 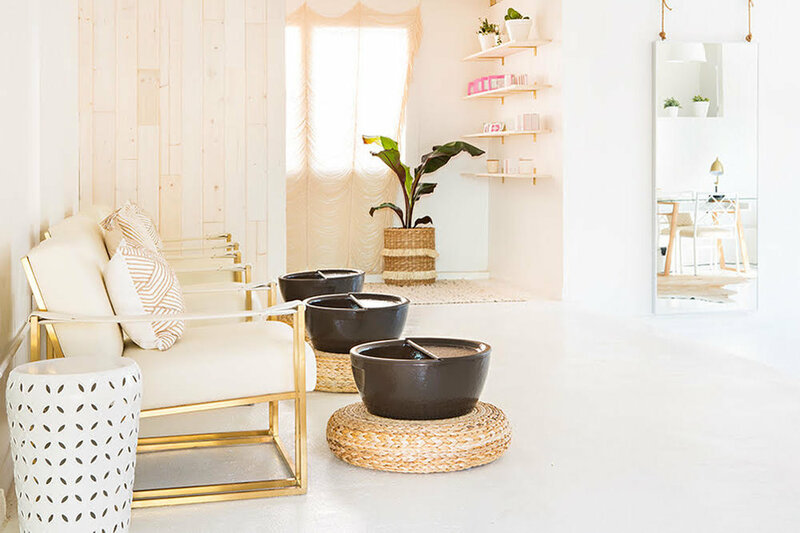 Ellie and Sass is Venice’s latest upscale beauty salon, its the one-stop shop you’ve been looking for. 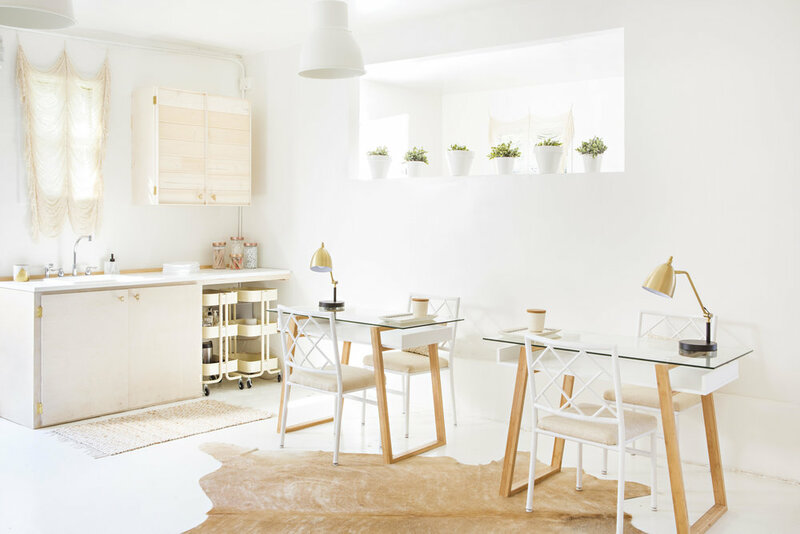 Get all the finest treatments, from nails and lashes to brows, facials and waxing in a retreat-like space that feels like you’ve left Los Angeles altogether. Sarah & Elizabeth : We’ve been friends for over a decade but it was only two years ago that we came up with idea to open a salon together. Elizabeth: Sarah who also conveniently happened to be my lash guru was doing my lashes in her home; we were talking about how exhausting it was to drive around town to get all of our special treats done and why didn’t a place like that exist? By the end of that appointment we realized we wanted to create it ourselves, and we did! Sarah: In just three months time we found a space and started building it out and designed it ourselves and we're so happy we did. The community has been extremely welcoming and thankful for our appearance, we quickly realized that we weren’t the only ones craving a place like this in our area. Ellie & Sass will help make your beauty routine easy and effortless. Hang out with like-minded women (and gentlemen, of course) for a little extra R&R in our outdoor lounge. Bring your laptop (or not), nibble on treats or just chill. Elizabeth: I cant live without my IS clinical white lightening serum, it helps diminish suns spots and gives your skin a glow that lasts all day. Anytime I have it on I always get compliments on my skin. Its my secret weapon . Sarah: I swear by Dazzle Dry for my nails. It's a high performance polish that acts like a gel but doesn't require LED lights and comes off with easily with acetone. It also dries completely in just 5 minutes!